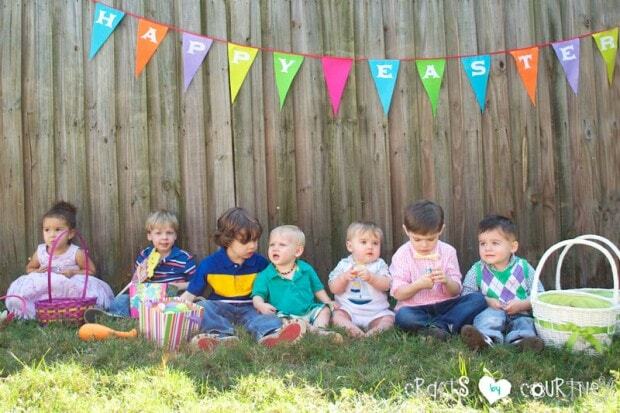 I was so excited about my Easter party this year. I just love getting together with my friends every year and celebrating Easter together. This is our fourth annual Easter party and I have been lucky to host it the past two years. I was really happy with how my Easter display turned out. I have been working on all the little crafts (like these Peeps Easter kebabs) for a couple weeks. I think it really paid off. Everything really came together well. Adding beautiful flowers is a nice touch to the display table, especially for Easter. I made all the cake pops the day before with my friend. Our first time making cake pops. Not too bad, right? I loved the look of the baby carrots in the flower cupcake holders. The carrot pops are made from marshmallows and orange chocolate. I also really liked how the cheese puff carrots turned out too! The carrots in the middle were from the Dollar Tree. They had candy inside. How perfect were they for the display table? Moss Bunny: I cut out a shape of a bunny on white board and covered with hot glue then added my moss. Such a simple thing and makes a BIG impact with my display table. Framed Bunnies: My “love” bunnies look so cute and playful on each side on the display table. They were a lot of fun to make! Carrot Plasticware: I found the idea for my carrot inspired plasticware on Spoonful and had to make a few plasticware carrots myself. Such a clever idea! We always have a potluck whenever we have big get together with the families. Everyone always brings a special sweet treat. Our yummy treats table. We added a couple healthy options as well. My friend made this beautiful fruit cake for the party. What a great job! All these tasty treats were great additions to the Easter party. My friends are just so helpful. As always, I must have a craft for the kids :) We usually dye eggs, but this year I decided that everyone should just bring plastic eggs filled with goodies. Too many spills the years before. We don’t want to mess up those cute outfits! The kids really enjoy the Easter crafts at all the parties. They've come to expect it! The kids had a lot of fun making their Easter wreaths. As you can see, they were pretty proud to show their wreaths off! Side Note: Want an adorable Easter takeaway for the kids? Why not make your own with these chalk Easter egg party favors! The Easter wreaths and stickers were on clearance the year before at Wal-Mart. Each wreath was .25 cents, what a bargain!! All the kids had a great time decorating them. We all had a great time and the kids just LOVE hunting for their eggs together. We had a ton of them! I just love getting together with everyone. It’s such a great tradition we have started with our little group. Plus, us moms love any reason to get dressed up! !